Area chocolatiers and cottage industry bakers have come together to begin a sweet business venture in downtown Portsmouth in what is being called the Sweet Boutique. The brick and mortar building on Chilicothe Street is just what three local ladies have looked for, and have teamed up to make it a reality. The three have come together to create the vendor space and will be opening July 1. The involved businesses currently include Kakao Konfections, Lacie Pops, and Deans Fudge. All three of these local businesses have had major success in their industries and have been asked time and time again about opening a shop of their own. Kakao Konfections is owned by Karen Davis. Davis spearheaded the campaign to start the Sweet Boutique. After many chocolate courses, Davis is labeled as a certified chocolatier and has a history of making sweet treats for many local businesses, patrons, nonprofit organizational benefits, and more, all while creating educational platforms for elementary school children based on the rich history of chocolate and how it is created. Davis has worked at home, in a newly renovated chocolate and desert kitchen that she uses only for business. She then packages her product and sells it. She, and the other vendors, will continue to make products at home and then move them to their shop for sale, but the long term plan could involve building a kitchen. Davis explained that her chocolates have a wide range of flavors and creativity. Her chocolates come in various shapes and types, and in flavors such as raspberry, jalapeno, zesty margarita, salted caramel, buckeyes and more. Laura Phillips is the owner and operator of Lacie Pops. She began her cake pops business years ago as a fund-raiser for her daughter, Lacie, who was in need of a transplant. The family used the funds from the cake pops to travel to hospitals and stay in hotels. Lacie has since passed, but Phillips keeps her daughter’s memory living through the legacy of their cake pops. Cake pops are crumbled cake balls held together with icing and other candies, and are decorated on a straw or stick. “This is my continued therapy and I’ve really morphed them into something new, because I use my own recipe with homemade icings,” Phillips said. Phillips has products of different flavors, from key lime to s’mores, and has broken outside the box when it comes to the creation of these treats. Phillips said that she is continuing the business as a way to eventually generate emergency funds for families who are in need of a transplant. Jodie Chapman said that she will also be donating 10 to 20 percent of her sales to benefit Phillips’ cause as well, once she gets the business off the ground. Chapman’s business is known as Dean’s Fudge, which deals in a family recipe of fudge that has been updated to add various flavors and blends. The recipe came from her father, Dean Knittel. Chapman said that she made the recipe all through her childhood and decided to make it professionally in 2007. After years of dealing at the fair and different markets, she is ready for a brick and mortar shop of her own, and hopes to one day have stores in various malls. Chapman said that since word got out about her fudge, she hasn’t stopped. She says that she often gets hired to make batches of the fudge for business events and parties. Like her partners, her fudge comes in various flavors, such as lemon, cherry-chocolate, orange-chocolate, and more. Each of the businesses have an individual Facebook page set up for information on their products and a general Facebook page has been set up for the Sweet Boutique. Davis said that the shop has about nine booths that are currently open and the shop owners are taking applications for them now. Davis said that the booths can go to a vendor of any type, and not just someone in the food industry. Interested parties can gather more information from the Facebook page or by stopping at their location. The business also has a room in the back they are willing to rent our for $35 a day for parties and vendors. 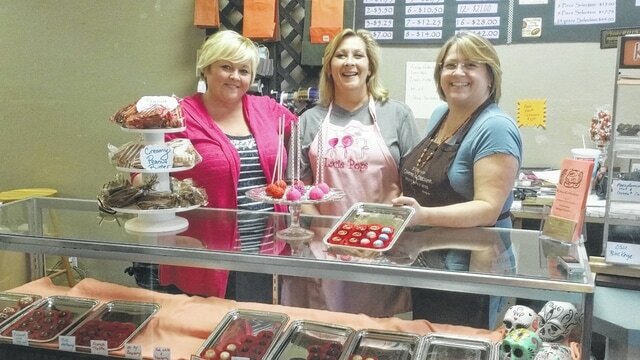 The Sweet Boutique is at 719 Chillicothe Street and will be open Wednesday, Thursday, and Friday from 1 to 7 p.m., Saturday from 9 a.m. to 3 p.m., and Sunday from 1 to 5 p.m.